Anyone know of plans to restore n27 weekend service? Even if at lesser frequency, I think that'd be a big service booster. I believe they implied it would happen in their July 2018 plan but I'm not sure if a timeline. New schedules took effect today. Spotted at Mineola Intermodel earlier: Makes sense, for now, to label as both routes, however I believe in their GTFS data they are still labeled as separate routes. Transit (app) lists them still as two separate routes that alternate on trips, however pdf schedule has been written to make trips indifferentiable. Let me know if your thoughts are different, but I imagine that they are moving towards eliminating the n41 tag on all mediums and making the route solely the n40, pending when they can update physical signage. Interestingly, although I was not taking this bus, as the bus door opened I heard the route designation as "n40". Of course, the next one could've said "n41" but I'm not sure if the route numbers are alternating on vocal announcements as they seem to be in route data. Basing this off of no concrete knowledge, but I wouldn't think so. With the transformation into a shuttle, far fewer cars will be devoted to that line, so especially with the surplus of stock that will come with the m9 deliveries, I think it's likely that trains will be 6 cars, as I'm sure the MTA will be happy to get as much use out of their renovated Nostrand Avenue station as possible. I'm not sure if this project includes an elongation of the platforms as well, but if so, eight cars would be welcome as well. Was waiting at Mineola a few nights ago for a train going eastbound at the west end of the platform, so I was basically alone on my side of the track. A westbound train arrives (M7), alights passengers, and then leaves. As it's heading out of the station, I notice the rear of the train is completely blacked out. Rear lights were not on. This caused some concern for me, as although the status lights on the side of the train display that it is there, it really looked like there was no train. My train was only a minute away, so I figured I'd alert the conductor of the train and its destination. Unfortunately, the conductor seemed more interested in avoiding the drunk guys throwing around Goldfish crackers a few seats away from me than coming for my ticket, so that option was out. At the end of it all, I just ignored the whole issue, which still irks me, as I wasn't comfortable with the situation. I considered calling the LIRR and notifying them, although I had no idea what number would make sense to call, as this was well outside of business hours. Even if more phone lines were staffed, I still wouldn't know who to call. I had also considered MTAPD, but I didn't know if this would qualify as an "emergency" in their eyes. For future reference, is there a good contact to inform of this safety hazard? Or is MTAPD the correct channel? Since Transit just displays the data from NICE's GTFS feed, I imagine Transdev messed something up along the way. Unless this is an inclusion of a plan to be implemented... Either way very interesting, wonder if something will come of it. A bit confused on the n22 plan here. The Mineola - Hicksville section will now only be serviced by the n22X? And the local is to start at Mineola, and run only from there to Jamaica? I would hopefully be able to understand this better if there was an actual link to the new schedule. I guess they just haven't gotten around to creating it yet. Another thing, what is the thinking behind splitting the n24 into two legs without adding suffixes to make the separation clearer to riders. Yes, it may be part time, but why even part time? Just stick with something and do it. I definitely appreciate the thought they've put into these routes though, the 24 has consistently been one of the least reliable routes from my experience. By the way, even though it's now been well over a year (and a half haha), I am still mourning the loss of my beloved n22A. Truthfully, the service may not have provided the demand necessary to sustain the route, but it's been pretty difficult to live without it. the n27 just doesn't fit the niche for me. No talk of bringing it back, right? Thanks for the info. I did use the online contact form to ask if a solidified opening date is available. God only knows how long a response will take but they've been very good with intricate and technical GTFS-related questions before, so hopefully I'll get an answer. 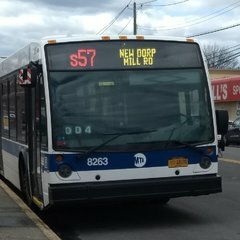 Hi everyone, I could use some help with a bit of bus route confusion in Staten Island. As everyone knows, the big news for Staten Island buses recently was the major redesign of the express network, and rightly so. However, when the new map (found here) was put out, I noticed a note in the upper left corner of the page a note about the S40/S90 regarding its extension to the new logistics park. This topic has been discussed here: That's all well and good, and I waited eagerly to see what would come in the fall. So now it's the fall. And I'm confused. I went onto the MTA's website today and got the pdf schedule for the 40/90. Hasn't been updated since September of last year. Okay, so the change hasn't happened yet, right? Keep in mind, I live nowhere near SI, so it's not easy for me to check this out firsthand. In light of the same schedule being in existence, I headed over to my transit app of choice to check out the route. Whoops, it's certainly different. It is showing the new route to the park, with the loop around Goethals Rd and Gulf Ave gone. Now, to make sure this isn't just a data translation issue, I went to BusTime to see it firsthand from the MTA. Same deal. Although, there was a bus on the map approaching where the route would split from where it used to go, at Forest Ave / Morrow St. It arrives at the intersection, at the final stop, and I obviously expected to continue onto the logistics park. Nope, sat there for over five minutes, and then I got tired of watching. Now, it's always possible the bus had a mechanical issue, but I suspect this has something to do with the new routing. What's getting to me is that on the map, both the old routing (presuming the loop is being eliminated upon the change) and the new routing are shown. What kind of practice is that? Were they planning to remove the old and put a new map out when the change occurs? Given the change in the GTFS data, they clearly didn't. So, to recap: Did the new route eliminate the loop towards the Goethals Bridge? Did the change actually happen fully yet, or did they shorten the route in preparation? If the change did occur, why hasn't a new schedule come out on the website? If the change has not taken full effect yet, why would the GTFS data be updated to a route not yet complete? Thanks in advance if you can answer any of these questions! By the way, the whole reason I looked into this is because I would've liked to take the S40 to its terminus to start the walk on the Goethals Bridge multi-use path, which, according to the woman on the phone at Port Authority, should open in the next few months. I gotta say, this is the first time I've been sort of happy with NICE in awhile. Getting excited for other changes they're making in the system in the upcoming months. Speaking of the new schedules, I'm digging the new design for the pdf schedules and the NICE website itself. NICE's initiatives are actually starting to impress me. Sorry, I'm incredibly late to this, but I am so happy they are planning on reintroducing weekend service on the 27. The users of the line have really suffered without it. I know I'm late, but might as well throw in my two sense. Usually, regardless of headways, for a bus route to have consistent ridership at both ends of the route, the destinations either would need a few connections or be at a population center or attraction (such as a mall which has been discussed). From the very brief research, as I am only somewhat familiar with Springfield Gardens and the surrounding area, it doesn't seem large enough to support a terminus of a route with small enough headways to encourage ridership. Possibly just on principle it should be slightly extended to reach a connection. At a larger scale, this route has always confused me. Seriously, go look at the Queens bus map. Just the sheer number of fairly frequent bus routes that extend from SE Queens along east-west corridors should fill the ridership needs to Jamaica of this area. Given this, I don't even see the point for the 77 to turn west when it reaches hillside avenue. This route could just be a north-south route, a function that it already fills, and its importance would remain. The same could kind of be said for the Q76 but to a lesser extent, as there are fewer routes that go from by that line more directly towards Jamaica, but the situation remains. Why not just combine the Q76 and Q77 into one cross-borough route? There's more than enough supplemental routes that go directly to Jamaica if that's the end goal for a rider, and avoiding Hillside and the dreaded terminal could calm bus bunching and delays. To reiterate, I would just say on principle that connections should be made where they can. Not saying it will affect ridership, but it's good to have I would say this area could use a Staten Island Express Bus-style redesign, but before that can happen, simple route improvements will have to do I suppose. Any thoughts on anything I put out? I'm a sucker for LEDs. Loving the train in pretty much every way. Honestly, I think it'd be too boring without the Cuomo wrap, and I think it's good the trains will resemble the buses. The flip seat weight limit lightly worries me, though. Also, the FIND display is brilliantly designed. But it's over the doors, unlike the current NTTs. How many per car would this mean if this design sticks?